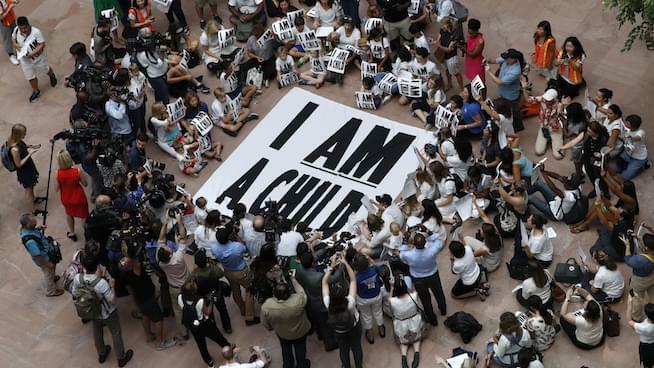 A record number of migrant children are being held at the border despite respected organizations speaking out on the psychological damage extended stays can have on young minds, especially those that have already been exposed to trauma. As of last week, there are 12,800 migrant children being cared for by the Health and Human Services Department, a sharp increase from the monthly average of children under their custody in 2016, which ranged from just over 4,000 to over 9,000, according to CNN. The news outlet found the inundation of the system appeared to be in direct correlation with the the administration keeping children in custody longer, not a larger influx of minors. According to an official who spoke with CNN, the daily discharge rate for unaccompanied migrant children is down to .6 per hundred from 2.0 per hundred in 2017. The math comes out to 5,000 more children being kept in custody per month. Host Chip Franklin was caught off guard by information — he thought the issue of children being unnecessarily kept at the border had begun to abate since public backlash halted the separation of immigrant families this summer. In response, he dedicated an on-air segment to the topic.